Lockout. 95 minutes. Rating: 18+. Director: James Mather & Stephen St. Leger. Starring: Guy Pearce, Maggie Grace, Vincent Regan, Joseph Gilgun. Have you ever wondered how Con Air or Escape from New York would play out if it were set in deep space? Luc Besson has, though apparently not too deeply, delivering a film that is somehow more implausible, less entertaining and more derivative than the films from which he so heavily borrows. While Besson outsourced directorial duties to untested feature co-helmers, James Mather and Stephen St. Leger, the fan-favourite producer was still instrumental in crafting the Lockout story, as well as overseeing production. As a result, it’s no surprise that Lockout features plenty of Besson’s staple calling cards: most notably a snarky but charming leading man (Guy Pearce), an erratic and overplayed villain (Joseph Gilgun), and some hard-hitting action set-pieces. What’s not clear is whether Besson’s vision was simply lost due to incompetent direction, or whether there was simply no real vision in the first place. The film is set in 2079, and follows an attempt to rescue the President’s daughter from a prisoner rebellion in a deep space jail. It’s not the most visually-stunning movie in the genre and definitely has a ‘budget’ look at times, particularly the rendering in some of the CGI sequences. The most disappointing aspect though is the lack of creativity in the sci-fi world that has been created. Mather and Leger were operating off a small budget (about US$20 million), but so did breakout South African hit District 9. 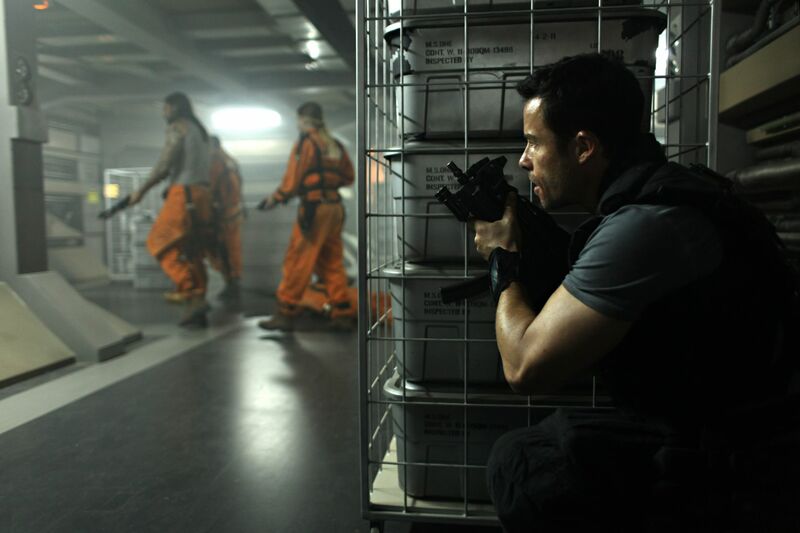 Here, a little more imagination could have stretched that money a lot further – the sets and costumes and general vibe of Lockout feel like all the sci-fi of the past 20 years blended into an indistinct mud. There is no world-building, and we never really explore the film’s potentially intriguing universe. Similarly, the film fails to capture the scale of the deep space prison facility and the sheer number of prisoners that are running around in it. In the end though it’s not one big flaw of Lockout that dooms it, but a bunch of small, slowly accumulating ones, from dialogue that leaps from cringe worthy into complete nonsense and brazen plot holes. After starting with a humorous and dynamic interrogation scene, the air slowly drains from Lockout – a fun premise killed by a thousand cuts of slack direction and not a single original idea.